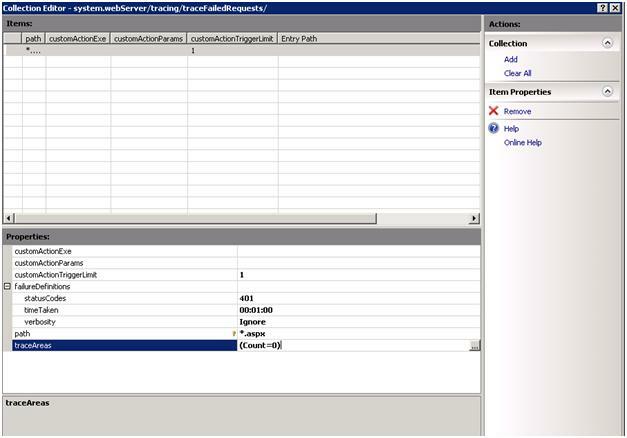 Use the Collection Editor within the Configuration Editor module to add a new failed request tracing rule for an aspx request that either returns a status code of 401 and/or takes more than a minute to respond. 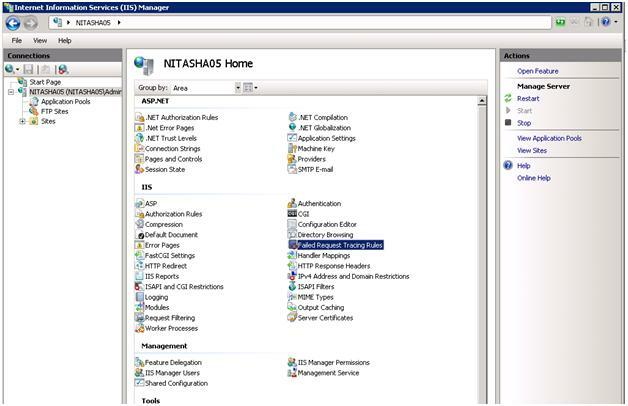 This task can be accomplished using the current user interface, but the steps taken will expose an important feature within the new Administration Pack Configuration Editor module. Select the (Collection) entry within Configuration Editor and click the … button next to (Count=0). This will open the Collection Editor to edit the tracefailedRequests collection. In the Actions Task Pane on the right hand side, click Add. You will now have a new entry in the Items section as well as a property listing. The Properties section of collection editor comes pre-populated with the schema defaults for the defined collection. In this case, you get the schema defaults for system.webServer/tracing/traceFailedRequests collection elements. There is a key next to the path property entry. This means that this is the unique key for this collection entry. Gold keys mean that this key must be unique for each item within the collection. A silver key means that this is a shared key. The combination of shared keys must be unique for a collection item in this case. Change the path entry to be *.aspx to create a rule for all asp.net paths. Select the (traceAreas) entry within Collection Editor and click the … button next to (Count=0). This will open the Collection Editor to edit the traceAreas collection. The Properties section of collection editor comes pre-populated with the schema defaults for the defined collection. In this case, you get the schema defaults for system.webServer/tracing/traceFailedRequests/add/traceAreas collection elements. There is a key next to the provider property entry. This means that this is the unique key for this collection entry. Gold keys mean that this key must be unique for each item within the collection. A silver key means that this is a shared key. The combination of shared keys must be unique for a collection item in this case. Click Apply in the Actions Task pane to make the changes to config. [Extra Step] If you don't want to keep any of the failed trace request rules that you created, edit the tracefailedRequests collections again and click Clear All in the Actions Task Pane. Click Apply within Configuration editor and the newly added rule will be removed. 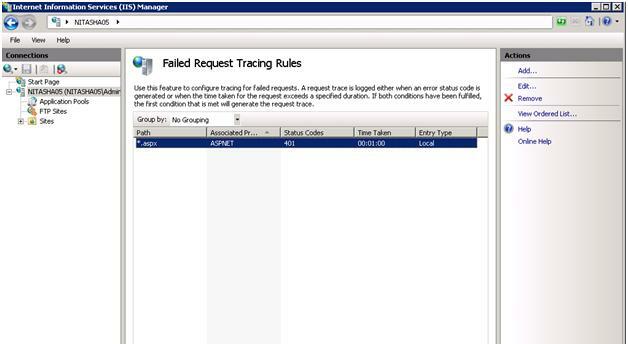 You have now created a new failed tracing request rule using Configuration Editor's Collection Editor tool. Collection Editor exposes all of the configuration settings for a given collection.